I come to praise local television news, not to bury it. Okay, there won't be much praise, and there will be some burying. But I bastardize and invert the famous line from Julius Caesar for a reason: My goal isn't to criticize and mock the newscasts of the four Quad Cities television stations; I want instead to help make them better. But before one can prescribe, one needs to diagnose what ails the patient. And before diagnosis, one needs to establish the basic state of health. I used two measures of local news for each newscast: the number of local-news stories, and the number of on-camera or audio interviews. And there were many situations when I had to decide whether something qualified as news. On January 14, WHBF ran stories on a speaker on bullying (with an interview) and the Be a Tourist in Your Own Backyard promotion (also with an interview); those could have been news stories with different angles or more context. (The bullying story, for example, could have offered information on the scope of the problem, or how it's being addressed in local schools.) But as presented I didn't believe either story qualified, so they (and their interviews) were not counted. Reports on dangerously cold weather and school closings were only counted if they offered something beyond the facts that the weather was dangerously cold and some schools would be closed. These are admittedly crude measures. But the number of local news stories indicates the breadth of coverage, and the number of interviews hints to what extent actual reporting was involved. Both give a sense of the resources each station is devoting to its local news, and the emphasis on local news within the product - which, I stress, doesn't always correspond with more-insightful or -informative coverage. Strictly by the numbers, CBS affiliate WHBF had the most local news, with an average of 10.6 local news stories each night and 6.2 interviews. NBC affiliate KWQC had 5.4 stories on average and 6.2 interviews. Fox affiliate KLJB (produced by the KWQC news team) had 8.8 stories but only 3.8 interviews. ABC affiliate WQAD had 5.2 stories and 4.6 interviews. WHBF and KLJB could best be described as "summary" local news - with an emphasis on the number of stories. WHBF, however, had as much evidence of reporting (in terms of interviews) as KWQC - both tops during the survey period. But while they had the same number of on-air interviews over the five days, KWQC's coverage one night of Iowa high-school-football realignment from the Mississippi Athletic Conference to districts skewed its interview number significantly higher - with four interviews combined in the news and sport segments. Considering that this "team coverage" was at best marginal news - as opposed to sports - that must be considered in the equation. In other words, the CBS affiliate simply offered the most local-news stories and interviewed the greatest number people for its news coverage. Using both measures and a smell test, I rank WHBF as the best during the survey period, followed (in order) by KWQC, KLJB, and WQAD. In some ways, I like KLJB more than its news partner KWQC. I personally prefer the one-anchor format (more on that in a bit), and I appreciated its volume of coverage. Plus, I think the writing on KLJB is often better on the same stories with the same footage. But it's third here for the simple reason that WHBF employs a similar more-is-more technique and does it better. As for WQAD, it had the fewest number of local stories and the second-lowest number of interviews. There were situations when it covered stories better than its competitors. But its heavy use of fluff - and especially non-local fluff - is indicative of an operation that simply doesn't focus on local news as much as its peers. In its January 23 newscast, for example, WQAD devoted time to a new indictment in the 1978 Lufthansa heist (arguably news, but framed by Goodfellas), a calendar featuring senior citizens re-creating famous images from movies, the developers of Candy Crush Saga trademarking the word "candy," Norwegian Olympic-team outfits, and Lake Superior ice caves. That's five non-local time-killers on a day when the newscast featured four local-news stories. My basic conclusions suggest a couple of shifts since fall 2010, when I previously surveyed local newscasts (RCReader.com/y/news2010). 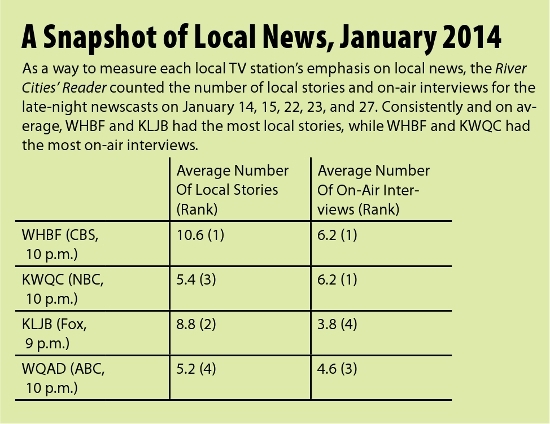 Back then, I noted: "KWQC had the most local and state news in time terms ... and the most local/state-news on-camera interviews, but WHBF devoted a greater percentage of its newscast to local news and - by a wide margin - had the most local/state stories." Back then, I thought KWQC's newscast was best, with WHBF a close second and WQAD and KLJB a distant third and fourth, respectively. Now, I'd put WHBF at the top over KWQC - the most significant difference from 2010. The other change was the passing of KLJB's newscast from WQAD's staff to KWQC's in late 2012. The KLJB newscast now basically splits the difference between KWQC and WHBF - using the former's footage and the latter's more-stories format. Because of this, KLJB's newscast is now superior to WQAD's. 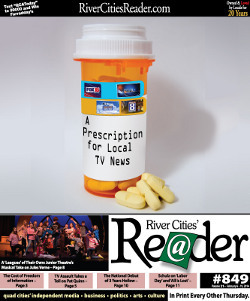 The biggest challenge Quad Cities television stations face is their territories. Coverage maps indicate a coverage area with a radius of 45 to 60 miles from the Quad Cities, and Nielsen estimates that this market includes more than 300,000 TV homes. Of course, that's spread over two states, lots of counties, and dozen of cities and towns. And unlike our daily newspapers, they're distributed evenly among the Quad Cities and surrounding areas - not mostly on one side of the river. To be generous about it, our local news is unsatisfying in large part because it has an impossible task: covering more than 6,000 square miles in the less than 10 minutes that stations devote daily to local and state news in their late-night newscasts. That's exacerbated by the self-evidently lean news staffs these stations are employing. According to their Web sites, KWQC/KLJB employs nine reporters (some of whom anchor the nightly Fox newscast), WQAD has nine (including two anchors/reporters), and WHBF six. Considering the amount of local-news time they're filling each day, that's not a lot of people. So it's fairly obvious why Quad Cities newscasts are so frustrating. Fundamentally, none of them seems to cover the Quad Cities area particularly well. And there's too large a focus on individual crimes, accidents, fires, and (during the survey period) bodies found outdoors. Those can all be traced to the twin challenges of a huge coverage area and small reporting staffs. When you add in the traditional shortcomings of local TV news - such as a lack of useful context, reporting that rarely gets deeper than surface conflict, dumb banter, canned features, and on and on ... - one could view the goal of improving local TV news as a lost cause. That's particularly true because it would be naïve to expect our local stations to devote more money to their news-gathering operations. With that in mind, I offer two sets of suggested improvements for our local television-news outlets. The first set is akin to a doctor prescribing medicine; these require little sacrifice, but they do take desire and follow-through. The second set is akin to the doctor telling a patient to exercise and eat better; these necessitate lifestyle/culture changes. And because I already invoked naïvety: Yes, I know that our news stations have consultants and corporate parents whose advice and mandates will differ from mine. Humor me. Dump the two-anchor format. Two anchors create the temptation for aimless chitchat, which wastes precious time. But more important, two anchors waste money. If anchors and reporters made the same salaries, a station could cut an anchor and hire an additional reporter. But it's likely that cutting one anchor position could free up enough money to hire more than one person - or to hire one person and raise news salaries to attract better reporters. Don't bother with national and world news. Late-night newscasts once served the function of summarizing the world. But that idea is at least a decade out-of-date; if people want to know what's happening in the country and the world, they'll watch the 24-hour news channel of their choice, or check the Web, or their Twitter feed, or Facebook ... . I suspect that national news (like non-local fluff) is largely used to eat available time in the absence of local reporting, but giving local stories depth and breathing room (which would happen with the implementation of these suggestions) can eliminate the need for filler. Attribute. The broadcast practice of "rip 'n' read" takes several forms: using scripts and footage from syndication services, or re-writing articles from other sources and passing them off as one's own. Based on the pervasive lack of specific attribution for almost all news stories that don't involve audio or video interviews, the latter appears to be happening a lot on Quad Cities television. To combat this - or the perception of it - make it policy and practice to attribute all factual information to human beings with names, or to specific documents. No more "According to people we talked to ... ," or "City officials said ... ," or the presentation of facts without sources. As math teachers often say: Show your work. Summarize in a single section of the newscast. That "attribute" suggestion above was partly disingenuous, because I recognize that there's no way TV stations are going to stop the rip 'n' read practice. But they should re-organize their broadcasts to showcase and give more weight to their actual reporting. Devoting a later-in-the-newscast section to a concise summary of local news - without the implication that they actually reported it - would be more transparent and effective. Get the facts right. If local TV news outlets must rip 'n' read, they should at least show evidence of reading before ripping. On January 27, news partners KWQC and KLJB both reported on a Farm Bill compromise, with hilariously bad - and different - results. KWQC noted $24 billion in cuts over 10 years - including $19 billion in subsidies and $9 billion in food stamps. Those numbers might be correct, but without explaining the $4 billion that seems to be missing from that equation, it just looks like somebody needs to shore up their arithmetic skills. KLJB, on the other hand, claimed that the deal would "preserve food-stamp benefits for most Americans and continue generous subsidies for farmers." I prefer bad math to those unnecessarily vague, wholly unsupported, and downright incorrect assertions. Require reporters to have at least two on-camera interviews for all news stories. The old saw is that there are two sides to every story, but there are usually many more than that. In TV news, however, you might think there's only one side to every story, given the number of pieces that feature only a single interview - even in situations with obvious conflict. Mandating multiple interviews is not the solution, but it will naturally lead to more rigorous and in-depth reporting. During the survey period, 150 local-news stories featured only 104 interviews - a symptom of both rip 'n' read and under-reporting. Let people talk. The goal of a news story shouldn't be to prove that the reporter or camera operator talked to two people by including eight seconds from each of them. It's to help people understand what's happening, or why they should care about it, or why different people have different views on a subject. That only happens when on-camera sources are given the opportunity to articulate their views. Don't choose a short sound bite to prove that somebody was interviewed; instead, choose the portions of interviews that tell the story properly, and let them run as long as necessary. Put a leash on weather. It's no surprise that there's such a huge focus on weather in our newscasts: It's the only local story that affects everybody. But weather gets entirely too much play - especially when it involves things that have already happened instead of the forecast. Before the full mid-broadcast weather segment, keep it brief and keep it to the forecast. We already know it's cold. Diversify interview subjects - especially elected officials. Elected officials, of course, should be interviewed by local news outlets. But it's important to remember that except when they're in trouble, they benefit from getting their faces on the local news. During the survey period, all three news operations did stories on one of two Illinois laws - cell-phone use while driving and concealed carry. The only law-enforcement official interviewed in any of those stories was Rock Island County Sheriff Jeff Boyd. Those stories would have benefited from interviews with other Illinois sheriffs in the coverage area, or (with the cell-phone story) municipal police chiefs. Rethink crime/death/accident/fire reporting. People are interested in crime and death and accidents and fires, but single crimes and deaths and accidents and fires are not news beyond the reality that they've been traditionally reported as news. Most of these incidents are isolated and do not affect the larger community. Why, for example, was the third local-news story on KLJB's January 27 newscast a Muscatine domestic-violence case? Crime trends, on the other hand, are important, and there are many ways to approach the topic of crime that connect it to other crucial issues - poverty, drugs, law enforcement, neighborhoods ... . Chasing police cars, ambulances, and fire trucks might be an easy way to fill broadcast time, but that doesn't make it news. Resurrect "News You Can Use." That popular slogan was a justification for all manner of worthless soft-news coverage. But in intent if not practice, it was a perfectly sound concept. When deciding which stories get assigned and how they'll be covered, ask basic questions. How does this affect our viewers? What do they need to know to form an opinion on this topic? Who can best explain this situation for our viewers? How can we present this in such a way that the story can be relevant to people not directly affected by it - e.g., how can we cast this Moline story in a way that people in Davenport will find it useful? Tell audio and video stories. Television has a huge advantage over print and radio: the ability to tell stories in pictures, motion, and sound together. But our newscasts are dominated by anchors reading scripts on-camera, interviews, and generic footage (often stock, and often re-used within a single story). Too rarely do our TV stations take advantage of the medium. Interviews are essential, but the right pictures and sound can meaningfully augment them and lead to artful, wordless passages of storytelling. Embrace provincialism. KWQC and KLJB are based in Davenport. WHBF is based in Rock Island. WQAD is based in Moline. Hmmmm ... . If the core problem of local TV news is not having the resources to cover the entire broadcast area well or comprehensively, isn't an obvious response to narrow the focus? I'm suggesting that can most naturally be done geographically. So WHBF might focus on Rock Island, while WQAD could emphasize Moline, and KWQC/KLJB could cover Davenport and Bettendorf above all else. They could still do coverage in the other cities and outlying areas, but concentrate efforts on one area. Choose areas of emphasis, and do them well. Provincialism is admittedly a bit arbitrary given the broadcast coverage of our local stations. But the basic idea of focusing on specific areas can be applied to both topics and styles of journalism. Education and schools, good government, the economy and business, arts and culture ... . Resources are too meager to give each reporter only a single beat, but allowing them to specialize more will result in richer reporting. On the style front, KWQC gave Mark Steven the title of "investigative reporter," and he does longer-form, more-in-depth stories that elevate the station's newscasts. In other words, choose an identity - any identity. There are three basic problems with TV news in the Quad Cities: The stations (1) choose what they cover seemingly randomly, (2) cover much of the same seemingly random stuff, and (3) often cover much of same seemingly random stuff similarly. Only masochists know this with certainty, because most people watch one of these broadcast each night at most. But as a masochist who has twice in the past four years watched all of the stations for at least four nights, let me say that the sameness and spottiness are exhausting. It's clear the stations understand to some degree the need to distinguish themselves. They've all branded their weather; WHBF and KLJB have embraced a summary model that presents more stories than their competition; KWQC has its investigative reporter and touts its "team coverage"; and WQAD apparently aspires to be the lightest and most personable newscast possible. But they need to thoughtfully apply that basic idea of differentiation to everything they do. If each station chose a handful of niches to own, they could each be indispensable in their own way - instead of all being disposable. My critique and suggestions might seem harsh, so some encouragement is probably in order. Each news station showed strength in the broadcasts I watched - and those strengths hint at how they can implement my suggestions. WHBF. You have fewer reporters than the other news operations, but you provide the broadest summary of local news in the Quad Cities. And on January 13, your story on getting paid for pothole damage to cars was actually useful. Christine Souders was specific and clear about the process and criteria in Moline, while the KWQC/KLJB reports were maddeningly vague in those areas. Similarly, your January 27 report on the propane shortage gave an informative (if one-sided) peek at why some companies' prices aren't as high as others. The January 15 story on Illinois' new cell-phone-use-while-driving law helped viewers understand why so few tickets had been issued under the law. And on January 23, I thought you made a wise choice to ignore football realignment on the Iowa side in your news segments, pursuing my idea of provincialism before I'd made it. KWQC had it covered - although it wouldn't have hurt if you'd mentioned it in sports, as WQAD did. When you trotted out the "team coverage" model for changes to local high-school-football schedules on January 23, you offered a good explanation of the effects on travel and rivalries, as well as a robust range of reactions from fans, athletes, and administrators that did justice to the topic - although I'm still skeptical it qualifies as the lead news story of the day. I also appreciated your January 27 story on issues with home heating during extremely cold weather - although I wish you would have talked to more than one person. This was information that could be genuinely helpful to viewers. And on January 29 and 30 and February 3, Mark Stevens had a series on the costs of flood-insurance reform that showed how good local TV news can be. These three segments were reasonably focused on distinct facets of the issue, included specific examples and stories, provided comments from members of Congress representing the Quad Cities, added voices from different experts, and gave strong contextual background. It was clear, also, that significant thought went into presenting the stories visually. KLJB. You're the red-headed stepchild of the Quad Cities news market, but KWQC's approach to your 9 p.m. newscasts is smart. The "9 at 9" slogan/format means you actually have more local news stories than your favored sibling - which differentiates you and gives people a reason to watch. And although you use the same raw materials, there were several examples during the survey period of KLJB stories being clearer, more specific, and simply better than your NBC partner. While KWQC mentioned a sewer-rate increase in Rock Island as a footnote to the mayor's state-of-the-city address on January 13, for instance, you led with the sewer-rate increase - the real news. WQAD. Brittany Lewis' January 27 feature on "recording tornado stories" following the November 17 disaster in Washington, Illinois, took a restrained, get-out-of-the-way approach to a project of the Peoria Riverfront Museum: It let the people who were recording their stories tell their stories, with minimal interference from the reporter. Most of the narration was fundamentally unnecessary, but the atypical tack of the piece hinted at a different mode of storytelling for local TV news. Your broadcasts sometimes also showed more evidence of understanding the multifaceted nature of stories. On January 15, while other outlets merely noted the newly announced closing of JCPenney in Muscatine, you interviewed two shoppers and a representative of another business in the mall. On January 13, you included four interviews in a story on water problems in Henderson, Illinois - and not coincidentally had the best coverage among local stations. On January 22, your story on truck drivers stranded at the Iowa 80 Truckstop gave a broader sense of the impact of weather than the other stations.